Xilisoft Audio Converter Pro ist ein leistungsstarker professioneller Audio Konverter für Audio Konvertieren, Audio Extrahieren, Audio CD Rippen und Erstellen. Mit der Software können Sie verschiedene Audioformate inkl. MP3, WMA, WAV, AAC, FLAC, OGG, APE gegenseitig konvertieren und Audioformate aus populären Videoformaten inkl. high-definition (HD) Videos wie AVI, MPEG, WMV, MP4, FLV, MKV, H.264/MPEG-4 AVC, AVCHD extrahieren, Musik CD in verschiedene Audioformate rippen und Musik CD aus Audio-und Videofiles von allen Formaten erstellen. Xilisoft Audio Converter Pro is an all-in-one professional audio converter for audio conversion, audio extraction, audio CD ripping and making, with which you can convert between different audio formats including MP3, WMA, WAV, AAC, FLAC, OGG, APE, extract audio from video formats such as AVI, MPEG, WMV, MP4, FLV, MKV, H.264/MPEG-4 AVC, AVCHD, rip music CD to different audio formats, and create music CD from video/audio files. 1.Convert between popular audio formats including MP3, WMA, WAV, AAC, FLAC, OGG, APE. 2.Extract audio from general and HD video files including AVI, MPEG, WMV, MP4, FLV, MKV, H.264/MPEG-4 AVC, AVCHD. 3.Rip audio CD to popular audio formats. 4.Burn audio CD from popular audio and video formats. 5.Allows you to add and adjust lots of audio effects: fade-in, fade-out, volume normalize, band pass, chorus, flanger, echo and speed before converting audio and ripping CD. 6.Convert a single audio file or CD track to various formats simultaneously. 7.Split your audio tracks according to size or duration, or customize the split prior to converting or ripping. 8.Clip multiple segments from the source file. 9.Set a range of parameters to customize your audio output, edit ID3 tag info of your audio tracks. 10.Helps you transfer files to your iPod, iPhone and PSP directly after converting or ripping. 11.Processes files with multiple CPU cores and multiple threads for maximum audio conversion and ripping speed. 12.Auto-exit the application, shut down, hibernate, stand by system, or do nothing after conversion, ripping, or burning to keep you from waiting in front your computer. 13.Xilisoft Audio Converter Pro comes with English, German, Spanish, French, Japanese, and Chinese interface languages. 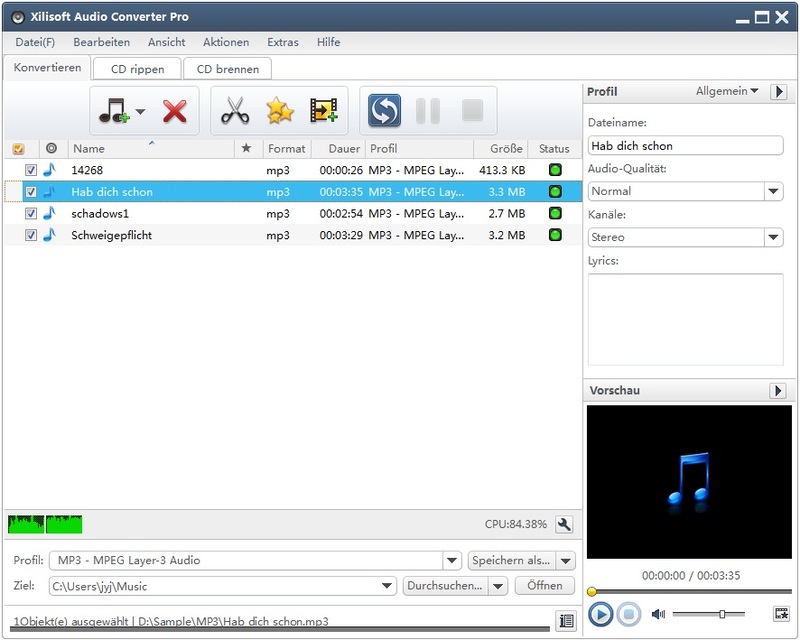 Hier gehts weiter zum Xilisoft Audio Converter Pro Download. Kaufe Xilisoft Audio Converter Pro jetzt einfach in einem unserer Partner-Shops. Das Herunterladen der Software Xilisoft Audio Converter Pro 6.1.2.0827 ist kostenlos (ausgenommen natürlich die Kosten für den Internetanschluss und die Internetnutzung). Für die Nutzung der Software gelten jedoch die Lizenzbedingungen des Herstellers/Anbieters.